So let’s finish up the fashion business with a little look at what a few of the other guests - the ones that aren't members of the royal family - brought to the party. One of the first guests to catch my eye: Countess Spencer in Pamella Roland with a Rachel Trevor-Morgan hat. A purple outfit after my own heart! With a wee cape! She was terribly elegant back in 2011, too, I still remember her blush pink ensemble with a massive hat. Lady Kitty Spencer caught my eye too, in a green Dolce & Gabbana Alta Moda dress with a hand-painted floral design and a Philip Treacy hat. Fantastic use of orange velvet accessories to give it an extra splash of interest. 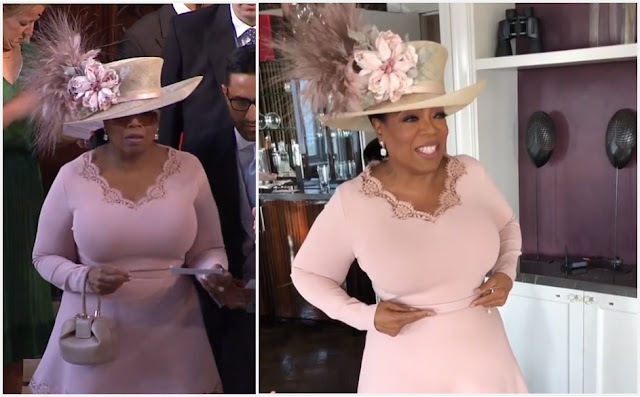 It’s hard to go wrong with a blush pink outfit for a royal wedding, isn’t it? Oprah would agree. 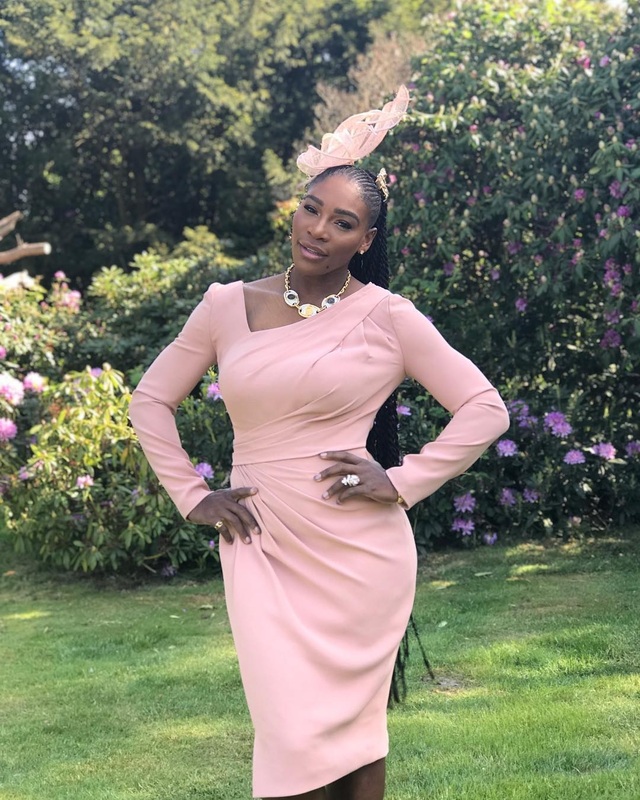 This Versace dress on Serena Williams is just right, as is the fascinator that keeps clear of her long braids. 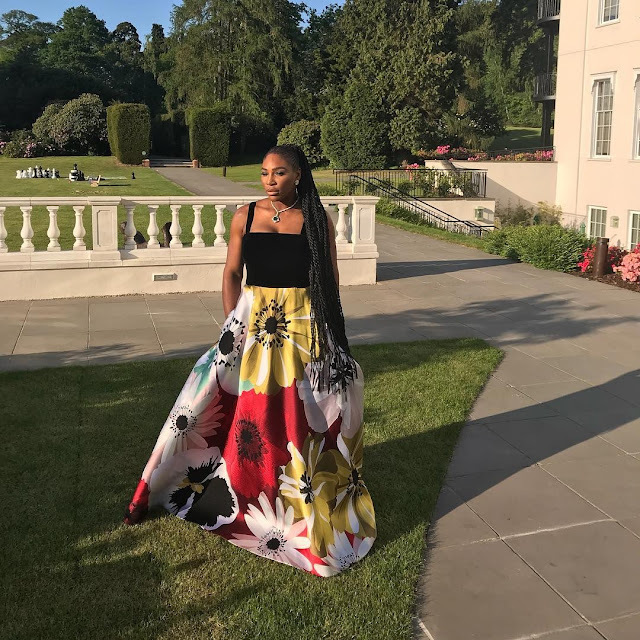 Serena also posted her look for the evening reception, a Valentino gown. Not everyone could carry this print off, yet on Serena, it's pure fun. Amal Clooney opted for a bold color choice for the ceremony with this honey yellow Stella McCartney midi dress with a side tie detail in silk Cady, accompanied by a custom Stephen Jones hat. I loved this ray of sunshine during the broadcast, but in the photos, I suddenly want a little color variation. Maybe not full yellow on the hat? Meghan’s good friend Priyanka Chopra posted just after midnight that she was still waiting for her outfit to arrive, but no problems here: this is Vivienne Westwood with a to-die-for suit silhouette. A Philip Treacy hat tops it off. Also to-die-for: Priyanka’s evening look from Christian Dior. That is one sparkly dream of a dress, no? Let's get this on a princess or something. The whole crew from Suits rolled up with their partners to support their former costar. I was watching all the guests arrive, trying to think which outfit I'd claim as my own if I were invited (as you do), and I think I found it: Jacinda Barrett's merlot grape Emilia Wickstead, be mine. Let’s end with the ever-appropriately dressed Middleton crew. The only surprise comes when you realize that Pippa’s floral dress from The Fold actually looks startlingly like an Arizona Tea can…and once you see it, there’s no turning back. Who else caught your eye at the royal wedding?